Amazon warehouse. Liberation screen shot of NJTV news video. The author is an Amazon warehouse worker. On the other hand, many have been quick to point out that the raise comes along with eliminating incentive bonuses and a restricted stock unit program, which will lead some long time workers to bring home less pay than they did before the raise. Thus this is hardly a “generous” move on the part of a company known for so many labor abuses. While these are important facts, there is one key element of which Amazon’s critics are either unaware or have not considered in connection to the raise. 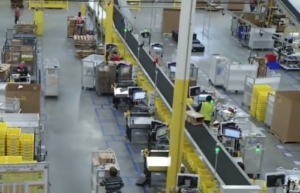 Amazon workers, like myself, are now expected to increase our productivity by 50 percent. How did this happen? The sortation center is divided into several lines of metal rollers to which employees are assigned, with the boxes unloaded off the trucks and then sorted to the correct lines by workers surrounded by different conveyor belts. Amazon made an incredibly simple change to how work is done by adding another line of short metal rollers at each side of the lines, effectively dividing each line into six sections, with four being on both sides of the two new rollers, and the last two sections being at the far end of the lines. Now, instead of each individual worker being expected to stack boxes on fifty different pallets, they are divided into groups that only have to cover between 10 and 20. This simple and cheap change in the division of labor drastically increased the productivity of the whole building. Although I can’t speak for every Amazon location, I can say that the success of this approach at the location I work means there is little reason for them not to use this new method at other buildings. Thus Bezos can hire fewer workers to do the same amount of work as before, or increase his company’s production by half. It is clear that the increase to $15 an hour is both an obvious attempt to bring back consumers who had strayed from the company following reports of its abuse of its workforce, as well as a response to the actions taken by many brave strikers during Amazon’s biggest sale of the year, Prime Week. But if we deserve the “fair day’s pay for a fair day’s work” that capitalists love to talk about, why are we not receiving instead a minimum of $19.50 that would be implied by the additional work we are getting accomplished? Although we no longer carry packages as far as we used to, we now carry many more boxes – some weighing over 50 pounds. On top of this, non-scanners, such as truck loaders, unloaders and “waterspiders,” those workers who wrap the stacks of boxes in plastic, have to keep pace with the increased scan rate. Without even taking the lost bonuses into account, Amazon–valued near $1 trillion–pockets around 35 percent of the wealth generated from the additional work we do. This is an increase in what Marx called relative surplus value, as the increase comes from increasing productivity during the regular workday, and not from lengthening the workday itself. As Marxists, we know that capitalists never raise wages merely out of the goodness of their hearts. Bezos’s move would have been impossible without the struggle of collective action on the part of Amazon employees, but it should not be forgotten that Amazon is attempting to fool the public into believing that it is paying its workers more for the same amount of work. In reality, where I once made $0.11 per box scanned, I now make $0.8. When carrying hundreds of boxes a day, this can drag on one’s mind. We must make sure Amazon workers and consumers who want to support them know the truth: Amazon workers are now being paid less for the work they do even with the wage increase.